This is an HP732C color inkjet printer. More accurately, it’s a homeless HP732C color inkjet printer. This was sitting outside a nearby Walgreen’s and I presume the owner brought it there to buy a replacement ink cartridge. As usual, the ink cartridge costs twice as much as the printer did and the owner probably decided to toss it instead. To add insult to injury, this printer didn’t fit through the opening on the trash can, so it just sits on the top….abandoned. I’ve heard that Americans discard an average of 130 million electronic devices each year. Each computer monitor contains between 5-8 pounds of lead, so these items are no longer being dumped in our landfills. Instead we recycle them. Or so we think. The latest dirty secret to be revealed is that 80% of our “recycled” computer parts are actually exported overseas to Third World countries. In most of these countries, there are no safety or environmental regulations. They can’t use the components. Instead, the unwanted pieces are dumped and burned in their landfills. The lead goes into their soil and the residue ends up in their drinking water. 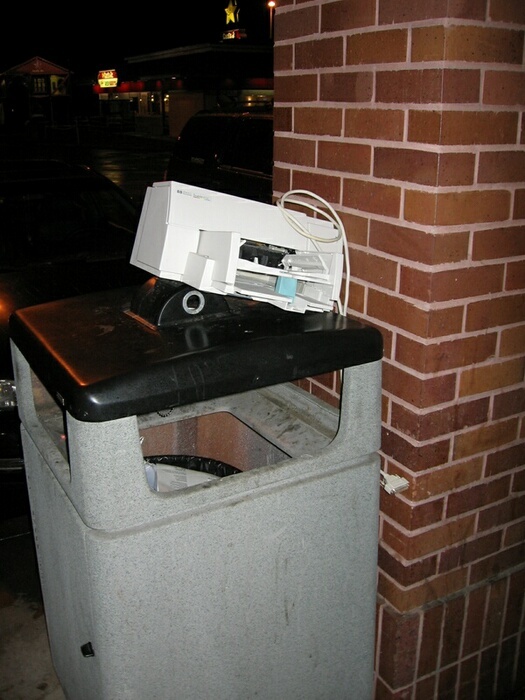 So maybe this is a better way to recycle – leave the printer on top of a garbage can and maybe, just maybe, someone will come along who needs it badly enough to give it a home. There will be one less piece of garbage in someone’s life….and one more in someone else’s.